Lighted control switch includes circuit breaker protection. Universal mounting brackets allow this item to be mounted with the outlets in any direction on the upright, frame, or any flat surface. 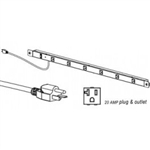 Accepts 15 and 20 amp equipment and features a NEMA 5-20P cord to plug into a 20 amp outlet only. Universal mounting brackets allow the Power Rail to be mounted with the outlets in any direction. 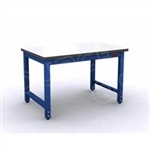 A versatile basic workbench with height adjustability and exceptional stability.